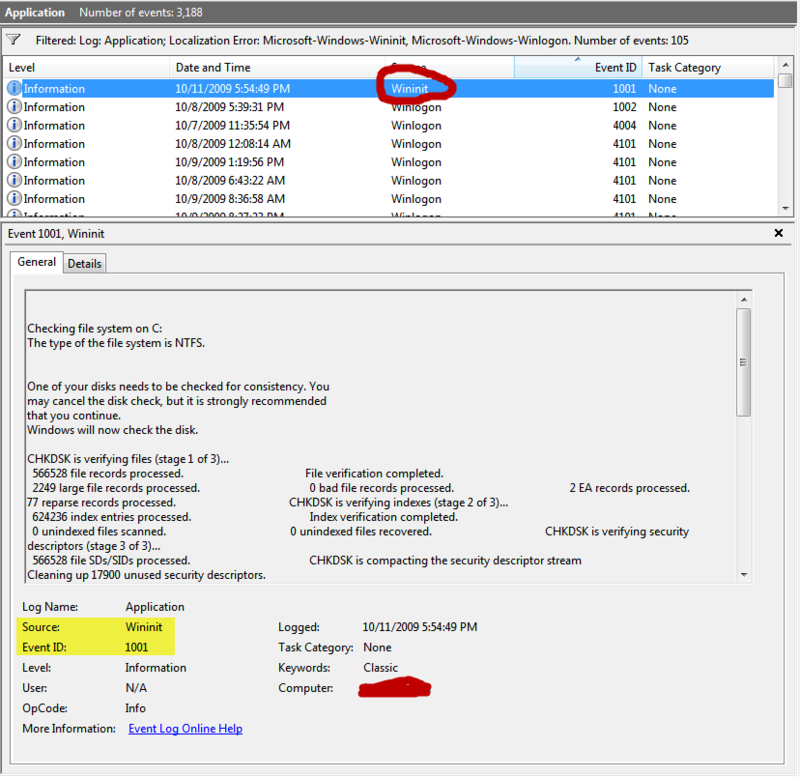 Windows tip of the day: viewing your chkdsk report – Jane Talks Tech! The first site I found online told me to check the built-in Windows Event Viewer tool (right after the chkdsk was done) which is accessible on Vista or Windows 7 by “event viewer” in the search panel. I was told to search for an event prompted by Winlogon (as the source) and to go with the most recent entry. Clearly, I was doing my search a couple of days after the event and I didn’t want to wade through score of entries in the event viewer. Start up Event Viewer by going to “Start” and going to search panel to type in “Event Viewer”. Then, sort by clicking the “Event ID” tab or “Source” tab. What you are looking for it an entry that coincides with a winlogon or wininit entry AND the event ID of 1001. […] on Windows Vista, once you open the Event Viewer, you need to select Windows Logs on the menu on the right side, and then select Application. Another commenter, (Denny) left this great tip for pulling up your most recent Windows 7 chkdsk results. It involves Windows PowerShell which is available on most Windows Vista/7 computers. 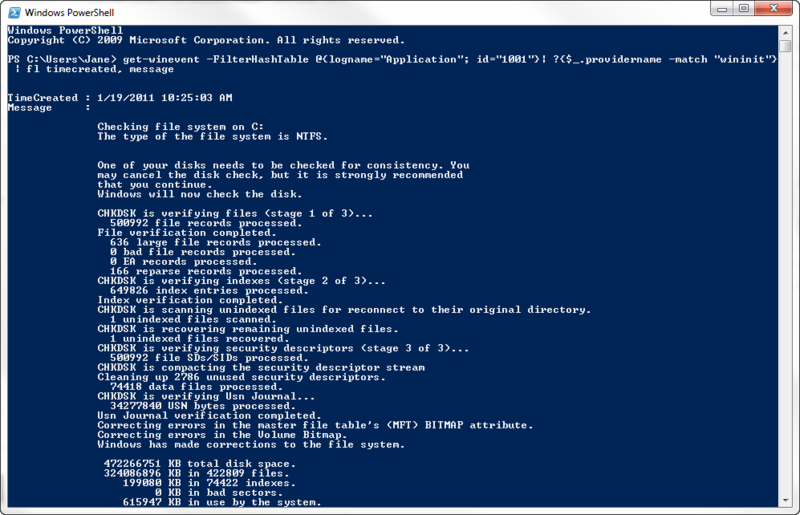 Here is his PowerShell command which I used and it’s vastly faster than digging through the Event Log. Simple copy and paste that into the Windows PowerShell command window and you’ll have your answer! To run it, click Start, click Programs, click Accessories, click the Windows PowerShell folder, and then click the Windows PowerShell item.